Features: Suitable for outdoor picnic,camping, survival and many other activities. It is waterproof and windproof,super strong and stable. Large expansion space,high performance. Super breathable large window. 8-10 person family tunnel tents team travel necessary studio halls air defense rainstorm camping equipment. It is perfect for family camping activities and can easily be folded and tucked directly inside your cars or anywhere you want to place Specifications: . This Car Side Awning can be easily mounted on vehicle rooftop rail to provide shade for you, your family and friends to relax in. 420D oxford fabric with 2000mm PU coating to protect you from UV and rain. 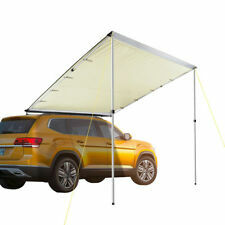 It is perfect for camping, picnics, car travel and other outdoor activities. 190T polyester with 1500mm water-resistant coating;. Got a truck?. You've got a camper! The Guide Gear Compact-size Truck Tent deploys in minutes in pickup beds, providing a fast, comfortable shelter that gets you up off the ground. Model: W836. Two Rooms with separate doors. Fits two queen air mattresses. This is a used item in good condition. This item works great and does not have any issues. Seam-Taped Rainfly for superior weather protection. Spacious yet remarkably easy to transport, the 4-Person Teepee Tent from Intense is perfect for family outings, solo wilderness excursions and more! With its tenaciously strong steel center pole and steel anchoring stakes, not even 30 mph winds can bring down this rock-solid portable shelter (when properly anchored)! This outdoor shower tent has a five-gallon solar shower that heats up with temperatures using sun light. This two-room portable shower tent includes a separate changing/utility room to keep your clothes dry. Rainfly included. 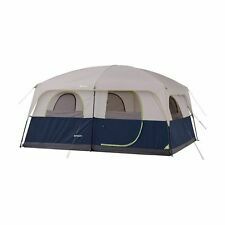 Ozark Trail 10 Person 2 Room Straight Wall Family Cabin Tent. This Family Cabin Tent is a spacious cabin style tent with large windows on all sides. It includes a room divider to make separate living and sleeping spaces and the center height leaves a lot of room to move around. 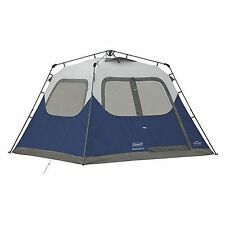 5 out of 5 stars - Ozark 10-person 2 Room Cabin Tent Waterproof Rainfly Camping Hiking Outdoor NEW! 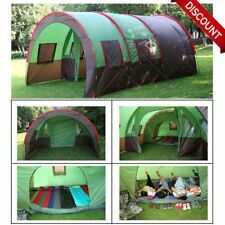 12 product ratings12 product ratings - Ozark 10-person 2 Room Cabin Tent Waterproof Rainfly Camping Hiking Outdoor NEW! Pick Up Truck Bed Camping Tent 1500mm Water-Resistant Sleeps 2 Fits Beds 79-81"
190T polyester with 1500mm water-resistant coating. The Guide Gear® Full-size Truck Tent deploys in minutes in pickup beds, providing a fast, comfortable shelter that gets you up off the ground. Topnotch construction, excellent ventilation, and adaptable options make the choice easy. LARGE SPACE: 5-person and 4-season family tent, it is plenty of space, enough sunshine and reasonable layout. ● Product: Forfar 5-Person 2-room Camping Tent. ● Material of External Tent: Polyester 190T PU 1200mm. This product is a necessarity for you. 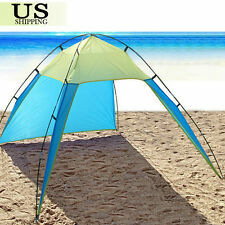 This item is a portable sun shade tent. Made by polyester material for durable use. Suitable for beach, camping, fishing, etc. 1 x Triangle Tent. - Fibre glass pole features high strength and firm structure. ● Product: Forfar 3-Person Tent. ● Material of External Tent: Polyester 190T PU 1200mm. ● Material of Bottom Tent: Polyethylene Cloth. ☞ How to Assemble a Tent. Do a practice run-through of setting up the tent. Three’s not a crowd in the roomy Winterial tent. A pair of big, two-layer zippered doors make it easy for campers and their gear to get in and out. Door screens provide excellent ventilation on warm evenings, while keeping out bugs and other small creatures. The tent and footprint are in excellent condition and have only been used for 4 nights total. This is an alpine tent made for high altitudes or dry winter conditions. For the tent and footprint specs see below (info from Mountain Hardwear’s website). The Ozark Trail 14' x 10' Family Cabin Tent provides plenty of room for the family to enjoy a comfortable camping trip. The two-room tent features a room divider to separate the living and sleeping areas and has large windows on all sides. Carry bag is a little scuffed up from being loose on a sporting goods pallet but it is not ripped or torn. Pics are of the exact tent you will receive. Trending at $129.91eBay determines this price through a machine learned model of the product's sale prices within the last 90 days. The tent has double snow tunnel entrances for winter and mountaineering use. The original owner lost the pole bag. The tent is in excellent, lightly used overall condition. No stains, no funky odors and the polyurethane coating on the floor and rainfly isn't sticky or peeling. BNWT - MSR Hubba Hubba NX 2 Person Tent, lightweight backpacking - Red. Designed for backpackers who need a tent that can do it all while still being compact and lightweight, our bestselling MSR Hubba Hubba NX 2-person tent feels as light and efficient to use as it does to carry. From its spacious interior to its quick setup, this tent redefines lightweight livability. 3-season Hubba Hubba NX tent lets you enjoy the full backcountry experience — including time spent in the tent. Trending at $332.24eBay determines this price through a machine learned model of the product's sale prices within the last 90 days. Condition is Used. See Hyperlite website for specs. You are buying a used tent. I am simply reducing my tent quiver. Specialized in Making Bell Tents.Located in USA.